As the Williams Racing team moves closer to the launch of their 2019 challenger the FW42 the Polish Orlen company took part in a press conference at Warsaw where the companies partnership with Williams was formally announced. 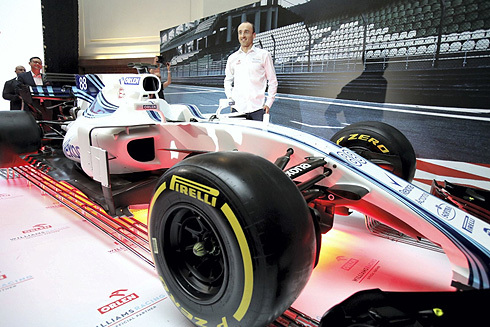 Present were representatives from the Orlen company as well as Robert Kubica. Orlen CEO Daniel Obaitek spoke of the partnership with Williams by saying: “It’s a two-year contract, but as the company is now engaged it has higher hopes from Formula 1. He also stated that he felt that the sponsorship deal guaranteed promotion of Orlen products by Williams. But in 2019 Williams will start the season with a new line-up of Kubica and reigning Formula 2 champion George Russell. Despite the struggles of recent years Kubica is confident the team will turn things around this year and hopes that his part in his role as full-time driver will assist in this process. Robert spoke of the situatio9n at Williams by saying: "The situation of Williams is not easy. I’m very cautious and realistic. In winter every team is building a new car. We are also building a new car, we're finishing its production [as we speak]. "The design of the car is very important and it’s very difficult to make up [for a bad car]. The team has drawn conclusions from its mistakes last year, so I think that's going to make things easier for us. Robert added: "In terms my co-operation and my technical contribution to the team, I'll do my best to put my best foot forward. But I’m not designing the car, I’m not going to produce parts for it. What I can do is give the right feedback, guidelines, that's what I'm going to offer. And I’m sure the team up at Williams will be able to, step by step, put Williams back on track. "But only in Barcelona will we know how strong we are, it’s really the watershed moment of the season." With the competition of the Orlen event Robert will return tio the Williams factory where he will join engineers who are working on the new car. From there the Williams team will move to the Circuit de Cataluña for pre-season testing running on February 18-21 and February 26-March 1.